FILE - A woman casts her vote with her child during the first round of the Tunisian presidential election in a polling station at Marsa, outside Tunis, Nov. 23, 2014. The vote was another step forward in Tunisia's peaceful transition to democracy. A peaceful transition to democracy in Tunisia proved to be a rare success story of the Arab Spring, yet as one official says, "many challenges" remain for the country. Tunisia was fortunate to have pragmatic politicians who favored compromise over confrontation. The Islamist political party Ennahda, which won the first elections after the 2011 revolution, voluntarily handed over power to a technocrat government. A strong civil society in Tunisia also helped with the move away from autocracy. However, Faycal Gouia, Tunisia's ambassador to the United States, says his country still faces serious problems going forward. Meanwhile, Libya is a nation in chaos with two battling governments, scores of militias and a security vacuum being filled by a growing presence of the Islamic State extremist group on Tunisia's border. “Islamic State fighters took advantage of the political fragmentation in Libya to occupy the coastal city of Sirte and succeeded in bringing a large number of foreign fighters across the uncontrolled borders,” said Wafa Bugaighis, Libyan charge d’affaires in Washington. “Intelligence estimates state that there are between 5,000 and 7,000 IS fighters in Libya." Many of those IS fighters now in Libya hail from Tunisia itself. According to a recent report by the security consulting firm Soufan Group, up to 7,000 Tunisians have joined IS in Syria and Iraq. The Tunisian ambassador called that an exaggeration. He added that, in any case, his country is well-prepared to prevent returning Tunisian fighters from becoming an added security threat. FILE - Tunisian police officers take positions as they search for attackers still at large in the outskirts of Ben Guerdane, southern Tunisia, March 8, 2016. On March 7, IS fighters tried to seize Ben Guerdane, a Tunisian town just 20 miles from the border with Libya, and claim it for IS. If the extremists had succeeded, it would have given the group free movement between Tunisia and its stronghold in Libya. 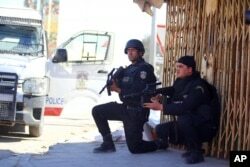 But Tunisian security forces prevailed in bloody fighting that left more than 50 dead. Following repeated terrorist attacks launched by returning Tunisian fighters last year, tourism — one of Tunisia’s major industries — dropped by nearly half. Officials of Tunisia and neighboring countries recently discussed the best way to counter the security threat emanating from Libya. Gouia said the outcome of the conference was promising. The Tunisian government hopes the arrival of Fayez al-Sarraj, the prime minister-designate of Libya's internationally recognized government, to Tripoli can be the first step toward stabilizing the country. But the rival government, which controls the capital, refused to allow him to come by air. Hours before he came ashore by ship, explosions and gunfire were heard in the city. Even if the political and security vacuum continues in Libya, Tunisia would oppose a unilateral Western military intervention to counter the expansion of IS fighters in Libya. “Our official position is clear: Any foreign intervention in Libya is not accepted by Tunisia. The only ones who can decide on any foreign intervention are the Libyans,” Gouia said. 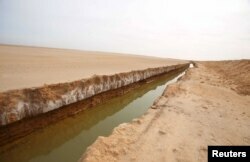 FILE - A general view of a trench that forms part of a barrier along the frontier with Libya is seen in Sabkeht Alyun, Tunisia, Feb. 6, 2016. Meanwhile, Tunisia is building a wall that's designed to stem the flow of fighters and weapons. It's a sand barrier that stretches for more than 150 kilometers and is reinforced with saltwater trenches and electronic surveillance. The U.S. Africa Command is providing Tunisia with counterterrorism training as well as improved capabilities in intelligence and electronic surveillance. “We are putting together a strategy to secure our borders, and the U.S. is very helpful in terms of training and equipment,” Gouia said. Many young Tunisians feel the promises of social justice and economic prosperity have not materialized after Tunisia's dictatorship was ousted in 2011. Educated Tunisians are often unemployed not only because of the post-revolution economic challenges, but also because the Tunisian economy creates fewer professional jobs. That creates an environment of hopelessness, says General William Ward, former commander of the U.S. Africa Command, who argues that counterterrorism measures will not be enough to counter the temptation toward violence. "We must present a scenario that opens the horizon of hope for the youth, with good governance, improving the economic and living conditions," Ward said. "As military action was a collective responsibility to counter terrorism, the global community should share the burden of sustained development in countries threatened by terrorism."